From time to time I receive offers of new books to review. Recently my attention was captured by the titles of two new cookbooks from Ontario publisher Robert Rose Inc., and I thought that as a natural expansion of our SASSY Suppers, undertaking practical evaluations of recipe books would be a useful new feature in the Sipping and Supping food-writing section of ReviewFromTheHouse. Our SASSY (Serious About Sharing Suppers, Yeah) group's supper themes have included Moroccan and Spanish, and after I became determinedly (but intermittently) "Low Carb", we also tried recipes from Karen Barnaby's 2004 book on low carb cooking, a moussaka recipe and cauliflower fried "rice". 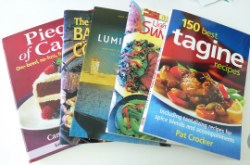 So when I approached my fellow SASSYs about trying out recipes from these and other new cookbooks, I got enthusiastic agreement. So enthusiastic in fact that our kickoff SASSY Cookbook Critique evening has morphed into a 16 person supper. We will be tasting tagine entrees and appetizers from Pat Crocker's "150 Best Tagine Recipes" and cakes from Camilla V. Saulsbury's "Piece of Cake!". For this special evening in addition to 6 of our 8 core SASSY group members, we have enlisted 5 couples, all enthusiastic foodies who enjoy baking and experimenting with new recipes. So watch this space for my reviews of these two cookbooks and forthcoming stories on The SASSY Supper Club Tastes Tagines and The SASSY SUPPER CLUB Eats Cakes. And to learn more about my "expertise" in the kitchen, watch for Gillian tries out her Tagine!